^ Nicholson, Brendon. World fury at satellite destruction. The Age. January 20, 2007. ^ 4.0 4.1 4.2 BBC News (2007). Concern over China's missile test. Retrieved January 20, 2007. ^ China admits satellite shot down. BBC News. 2007-01-23 [2007-01-23]. ^ China confirms anti-satellite missile test. London: The Guardian. 2007-01-23 [2007-01-23]. ^ China says space programme is no threat. Agence France Presse. 2007-01-19 [2007-01-22]. ^ New York Times (2007). China Shows Assertiveness in Weapons Test. Retrieved January 21, 2007. ^ Gordon, Michael R.; Cloud, David S. U.S. Knew of China’s Missile Test, but Kept Silent. New York Times. 2007-04-23 [2007-04-24]. 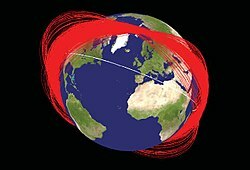 ^ "Britain Concerned By Chinese Satellite Shoot-Down"
^ ISS crew take to escape capsules in space junk alert. BBC. March 24, 2012 [March 24, 2012]. ^ "Fengyun 1C - Orbit Data. "[失效連結] Heavens Above. ^ Vavrin, A. B. Solar Cycle Sensitivity Study of Breakup Events in LEO (PDF). Orbital Debris Quarterly (NASA Orbital Debris Program Office). （原始内容 (PDF)存档于April 2, 2015）. ^ Melissa Gray. Chinese space debris hits Russian satellite, scientists say. CNN. March 10, 2013 [2013-03-11]. ^ 美称“中国碎片”撞坏俄卫星. 环球时报. 2013-03-11 [2013-03-11].